My favorite era is from the mid 20's to early 40's. But some 50's fans.... AKA Emerson. 1887 to 1915 and, if I have to narrow that down some, it would be 1887 to 1905 but then I might be missing some nice fans made just a little bit later. Cast iron is the magic ingredient in a fan. Heavy, hard, and nice and fragile if dropped. Slathered with black japan and, maybe, some nice factory pin stripes. My favorite era is as early as possible, the late 1890's to early 1900's. I find the older the fan, the more interesting it is to me. The older it is, the more history and intrigue it has. My favorites so far are my Emerson Tripod, type 1010, and type 11644. I also like the oscillator design on my R&M 3804. You screw a thumbscrew in or out to adjust the sweep. Early Emerson is my main interest. i have a deep respect for early cast iron and brass fans and like a lot of them, but i would have to say i really like the deco design and the smoothness of many of the 30's-40's fans, some of their designs are quite stunning. 1880s/1890s. After that they start to become less eccentric and more standard. I love early and odd technology. The earlier the better. What do I have? desk fans are 20s. CFs go back to 1900s. The design period in the late 20's - 30's. Cool stuff, pushing the envelope, changing the game a bit. I really like the early stuff as well, but more from a technical point of view, the egineering if you will. I collect it all, but have a fasination for the design period. I love early and odd technology. You like early and odd....try Hyer-Sheehan. That sure is a modern looking fan for that year of mfg. This is tough to choose. I like many eras, but if I were to have to pick them out, I would have to say the 1890's to the 1910's, as well as 1940 to the early 60's. I appreciate the construction and features of many vintage/antique appliances. The Tesla is a very fine example of true craftsmanship. 112 years old and still cranking away like new! 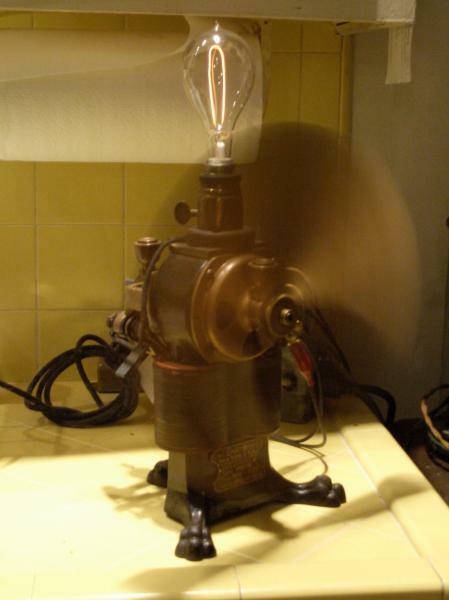 As for the 50's, Vornado made some revolutionary air circulators, which were big for that time and still are today! They may not contain tough cast iron and gorgeous brass, but they were also made to be mass produced and many have stood the test of time in my opinion. You have to remember that many of these fans, especially the vintage ones from the 50's have gone for decades without service! There are people out there who still use their fan that they bought brand new in 1956. No new appliance could last that long. As for me, I appreciate all the eras. I just prefer the really old stuff. Mainly because thats the main type I have that is older than the 1940s but. I really like the early 1920s fans with the S wire cages. pretty much anything that is mainly cast iron and brass. I don't have any brass cage fans but I'm sure I will get one some day. I want to get me a nice BMY or a 16" cake sometime down the road. edited to add that I like pretty much anything that is heavily built and ornate. The key ingredients for me are cast iron and brass. You can't beat that combination. I dont have much interest in anything after about 1910 but I do have exception like my three Veritys. The earlier fans for me hold much more interest because I think of how the world was back then and how people must have mused about these new electrical wonders. Just think are Pancakes would have been deliverd on a hourse and cart!!! 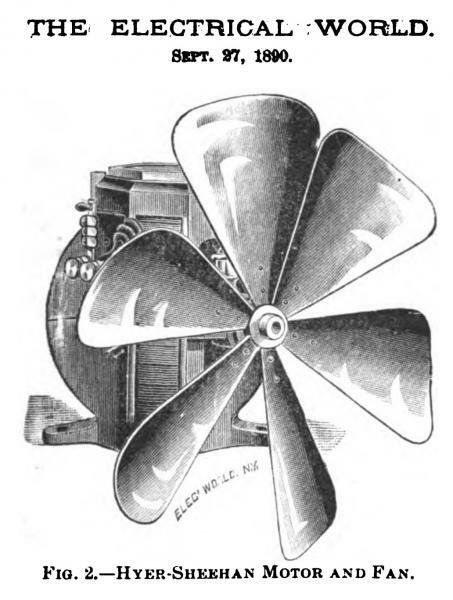 "That sure is a modern looking fan for that year of mfg." Yep, Terry, that's why it appeals to me (besides the fact it is made of unobtanium). OK Russ, find that patent. August 8, 1889 patent date in the ad. I tried a quick advanced search for "fan", the address, and "Globe" and the 2 months on either side of August 1889 with no success. The Aug. 8th date is a misprint and is what made your trail dry. The actual date was Aug. 6th of 89. Well those patents are the final bits to bring me to conclude that the Globe Fan Co. did not make a motor. On page 467 there is a blurb about a display of Globe fans in their Broadway address being driven by Crocker-Wheeler motors. It seems to be easier to make a "perfect fan" if you don't have to power it. William, hmmm, nice thoughts about the Veritys. Would you please post pics of them here? Thanks. Other than this you can't go wrong if you just concentrate on fans made before 1900. The more the original condition, the better. Late 30's through 50's. If I had to pick one year, I'd say 1940. Deco is great! Threads like these are always fun to read! I like plastic fans as much as cast iron & brass. Edit: Dave, the cage on that 1900 Dayton makes me dizzy looking at it!! William, hmmm, nice thoughts about the Veritys. Would you please post pics of them here? Russ Huber wrote: You like early and odd....try Hyer-Sheehan. seller and it was quickly yanked. The old fans are hard to find but they are still out there. Fan club conventions, other collectors, word of mouth, ebay, etc. Get the word out and search and follow up on leads. My last pre-1900 fan was an 1899 Emerson on ebay that I had asked a few questions about and the seller happened to tell me that he was considering pulling it from ebay and selling at a big antiques sale a few months later. When the fan was not on ebay the next day I contacted him and ended up driving to his home, about 100 miles away, and buying the fan. It didn't come cheap but I got the fan. It's best to learn about the early fans so, if one shows up, you know enough to try to buy it. Another one on ebay in incomplete condition but it looked very original and I was interested. I knew another collector who would probably end up with the fan and he did. Before the auction was over we made an agreement that if he won the fan he would make a blade and get it completed and running and sell to me. 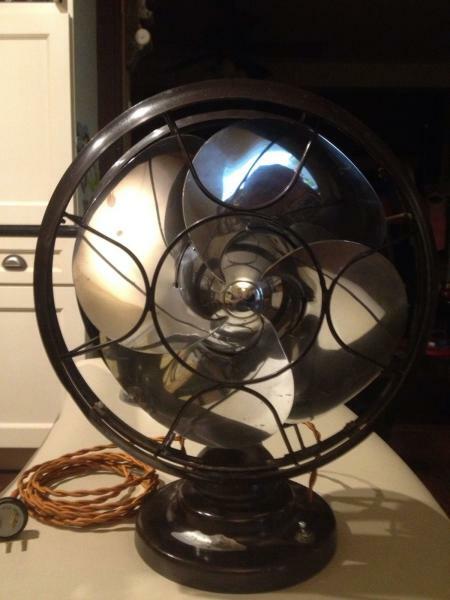 Perhaps my favorite fan and the oldest, an 1890 C&C. This is a photo from the ebay auction how it looked when I saw it. All done except for the new, reproduced blade. 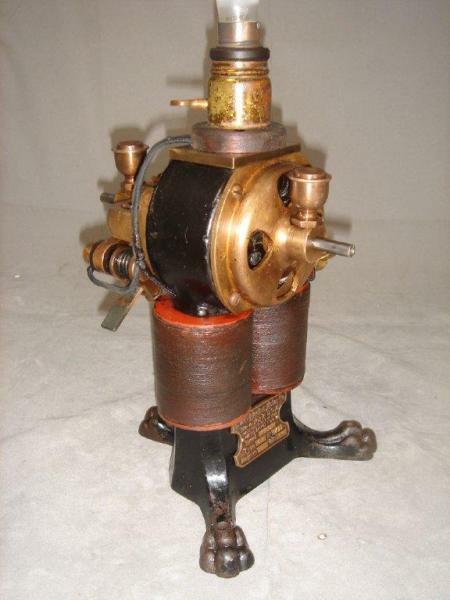 The motor needed work to run, some screws were missing or incorrect, motor need brushes, parts to the original light socket and a period correct c.1891 light bulb plus the blade. I was fortunate to know the person who could do this. There are amazing craftsmen in the AFCA who can turn a fan stump or very rough fan into a beautiful example. I'm partial to the 1930s-1940s. For me the era represents resilience of the American spirit. It is also the coming of age period for my grandparents' generation. I love studying the history, especially concerning WWII and the build up to Korea. May have a lot to do with my Marine Corps background! I absolutely agree in cast iron and brass, definitely. 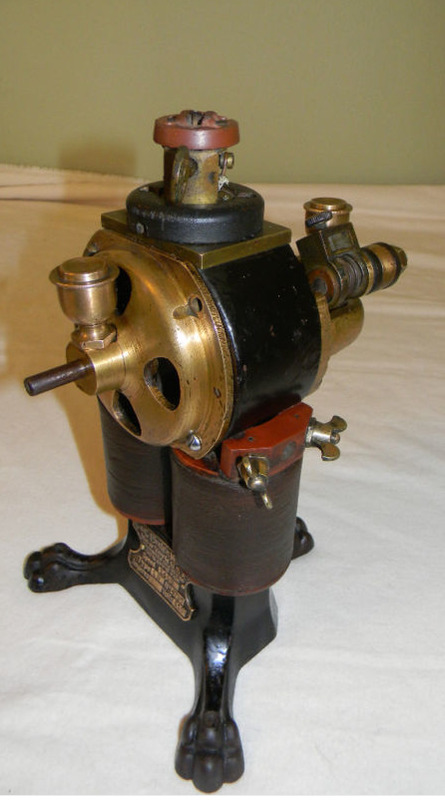 Old, preferably, but the thing that really fascinates me is the technical innovation especially the many different ways they attempted to make them oscillate. This would perhaps be 1910 to 1930? In particular, when the mechanism of the oscillation mechanism is exposed in full finger-mashing view like a French Martinot or waving about in a bizarre way to catch your eye across a room. For this reason I dream of owning a lollipop oscillator and a vane oscillator but they are like hen's teeth outside the US. As I no longer live in the USA, leaving long before starting collecting; so I will have to restore a couple or three Veritys Orbitals and twin levers to trade and negotiate with on my next trip to see my daughters I guess. Maybe plan a trip with time to visit the Fan Fair or one of the regional meets within a reasonable drive from Chicago? I'm in the wrong forum but 20s-70s. I'll take deco, chrome, and streamlined over brass any day. I mean - - "I Dig"
I have 10 of these in various states of repair - - 10, 12 & 16 versions!! Those Arctic Aire's drom the 40s had nice lines also. 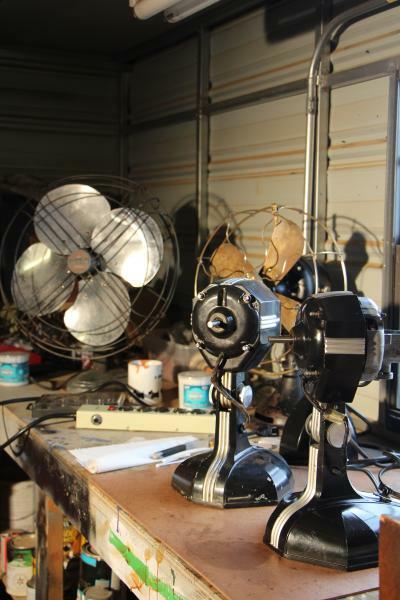 Portable Fans... Definitely the interesting, over-the-top turn of the century models. Century S4 Sidegear, Westinghouse Tanks, Emerson 6-wingers, etc. Ceiling Fans... I'm partial to late '20s-WWII era Emersons. Many variants and models, gobs of innovation (electrically-reversible in the early '30s, **PSC motors in 1937...) in a pleasing Art Deco style that is adaptable to many rooms. **Side note: I'm still looking to buy one of these, either an 85641-AK or 87641-AK. My favorites are definitely in the 1900 - 1920 range, brass & brass, 12" and smaller, and preferably oscillators. 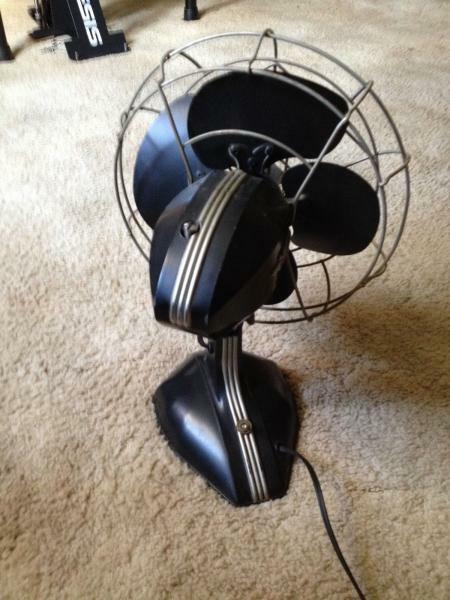 I love the appearance of this range of fans, their virtual indestructibility and especially their demonstration of the wacky ways designers came up with to get them to oscillate. You can see the progression from some really agonizing mechanisms to the simple devices that seem to work good and last forever. Page processed in 0.2447 seconds (16% database + 84% PHP). 35 queries executed.